Howdy, friends! I set a goal for this year to publish short stories every month to my blog. Here is one I wrote about Bloody Sunday written from the POV of the Edmund Pettus Bridge. Enjoy! Bridges are a connecting route over an obstacle. I am the gateway to Selma from Montgomery. The day I was completed I was so proud. Before me, there was an old two-lane wooden swing bridge that carried mule loads of cotton. I replaced that old bridge in 1940 and was a sight to behold: a steel arch bridge with a central span of two hundred fifty feet and nine large concrete arches. But my beauty was short-lived. I remember it like it was yesterday. A moment born out of grave injustice and death. You know it as “Bloody Sunday”. Indulge me as I tell you how it all began. Since about 1963 there was a hard push here in Alabama for equal voting rights. Less than one percent of black people who were of voting-age were registered to vote and the KKK was fighting with deadly force against anyone who tried to help blacks get registered. It was happening across the country. One day in a nearby town called Marion, a black man who was a deacon of his church and a civil rights activist, was brutally beaten, shot, and killed by Alabama State troopers while he was protesting the arrest of a fellow civil rights worker. He was trying to stop his grandfather and mother from being beaten by the troopers when one of them shot him in the stomach. He died eight days later. He was only twenty-six. That was the straw that broke the camel’s back. Folks in Selma had had enough and decided to march from Montgomery to Selma and the only way to do that was to go across me, the Edmund Pettus Bridge. Yes, that is the name of the person they chose to place across the top of my steel beam in large black letters. The name of a man whose family owned slaves. A man who was a grand dragon of the Ku Klux Klan, the most violent white terrorist group in Alabama. 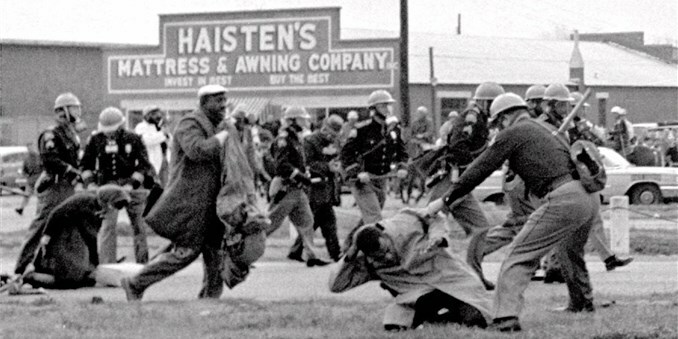 I was all at once the link between Selma and Montgomery and a symbol of all that was wrong with America. I was a beacon for tragedy. The morning of March 7, 1965 was thick with tension. Injustice and justice were about to clash. Injustice was there on foot and horseback dressed in Alabama State trooper uniforms and riot gear. They were armed with billy clubs and tear gas, and their blinding hatred was fueled by the cheers of supporters flanking the bridge waving confederate flags. Justice was there in the form of six hundred people armed only with love and sheer determination, to demand what they had been promised a century before: the right to vote. But the resolve of the six hundred was sure. The troopers pushed back two of the six hundred leading the cause. I heard the troopers’ footsteps quicken. A flood of sounds followed: terror-filled screams of the six hundred, the cheers of confederate bystanders delighting in the mayhem, small explosions and the hissing of tear gas, the thud of bodies being trampled to the ground, the thwacking of billy clubs striking unarmed bodies with brutal force, and the cloppity-clop of horses’ hooves as the troopers atop them drove men, women, and children back over the bridge, swinging at them with clubs, whips, and rubber tubes wrapped in barbed wire. All the while the six hundred never fought back….and they didn’t make it over me that day, either. The Alabama State troopers inflicted wounds so bad that fifty people were hospitalized. Two days later, the six hundred turned into two thousand people determined to walk over my expanse but when they got to the bridge a man named King told them to disperse. Things went back to normal for a while and the usual traffic went across me as if nothing ever happened. I thought maybe the six hundred had given up, thought maybe those troopers had beaten the dignity and determination out of everyone. But I was wrong. I should have known that a people descended from those who survived the terrorism of slavery wouldn’t be stopped. Two weeks later, thousands walked over me. They didn’t just use the sidewalks this time. No, they filled up my entire expanse and flowed over me like a mighty river. I cheered them on and hoped their footsteps were stirred old Edmund Pettus from death’s slumber and made him turn over in his hateful grave as he watched all those people – black and white – flowing steady and sure under his name toward victory. Before Bloody Sunday, I was a symbol of oppression and hatred. Today I am a landmark of Civil Rights. I wish I could tell you things got easier but it didn’t. Death, hatred, and injustice continued to flow freely. Shortly after they marched across my expanse, the KKK murdered a white woman named Viola Liuzzo. She had driven to Selma from Michigan and was shuttling some civil rights activists to the Montgomery airport. She was only thirty-nine years old and had a husband and five children. But nothing lessened the resolve of the Civil Rights movement. Fifty years after that day, this country’s first black president stood before me. He said Selma was a place where destiny had been decided. He said slavery and the Civil War and segregation and Jim Crow and the death of four little girls and the dream of a preacher collided here. So I stand proud today and wear my name as a badge of honor, not because of Edmund Pettus, but in spite of him. I am a reminder that hatred and injustice are no match for the hopes and dreams of the disenfranchised. I am the connecting route between injustice and justice. I am the Edmund Pettus bridge.